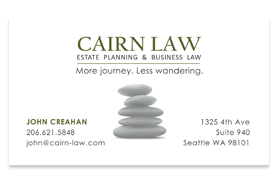 Cairn Law needed a temporary business card for use at an upcoming event. With little time to design and print, it was still important to create the visual relationship between the firm’s name and a pictorial representation of a cairn, a pile of stones that serves as a guide or marker along life’s journey. The solution was to use an icon-like cairn illustration. The challenge was where to place the tagline and icon on the card. After several iterations, the symmetrical approach was chosen. Objects that are symmetrical are perceived by the human eye as more beautiful and calming. To advance the calming effect, the cairn icon image was lightened, which also made the firm name the dominant visual on the card.